Capstone Realty, in Huntsville, AL, has teamed up with Legacy Homes to provide brokerage services to their new home communities in 2018. Capstone Realty agents will be on site across all communities to assist home buyers interested in building a new Legacy home or purchasing a completed home. Legacy Homes offers homes from 1,800 square feet to more than 4,000 square feet and prices start as low as the $160s. 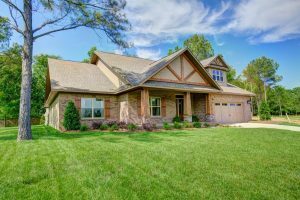 Legacy Homes is your premier New Home Builder in Madison and Huntsville. Our communities feature our award-winning designs with stunning amenities, excellent schools, and convenient access to Redstone Arsenal, Bridge Street, and more! Our Mission is to deliver the highest quality, energy-efficient homes with innovative designs at an extraordinary value, while providing a First Class experience that exceeds our client’s expectations. Locally Owned: The Four Owners of Legacy use their 100+ years of combined experience to deliver communities and homes that have the Perfect Blend of Square Feet, Location, Features, and Design. Best in Business: Legacy Homes has been named the 2017 Best in Business recipient for North Alabama – the only Home Builder to receive this distinction and the second year in a row to receive this prestigious award. The Best in Business Award program provides consumers a reliable resource to help guide, identify and select a business based upon experience, reputation, integrity, quality and trust. By Vertically Integrating the entire process from land development and architectural design to the final home, we create cost savings that are passed on to the buyers, giving them exceptional quality and value. Founded in 2009, Capstone Realty has quickly turned into one of North Alabama’s fastest growing local real estate companies. Capstone credits this growth on their continual pursuit of helping the residents of North Alabama with their real estate needs by placing their clients’ interest and goals at the heart of their mission. A commitment to integrity and service are a part of Capstone’s Core Values and this commitment resonates throughout the company. Capstone Realty featured on REAL Trends 2018 Up-and-Comers list! © 2019 NALMLS, Inc. All information provided is deemed reliable but is not guaranteed accurate by the MLS or Capstone Realty and should be independently verified. Listings marked with the NALMLS logo are provided courtesy of the North Alabama Real Estate Information Service, Inc. (NALMLS) IDX Database. IDX information is provided exclusively for consumers' personal, non-commercial use and may not be used for any purpose other than to identify prospective properties consumers may be interested in purchasing. Data last updated 2019-04-20T20:26:55.87.